On Wednesday, August 26th, the Belmont Child Care Association held its annual benefit in Saratoga at the Gideon Putnam, and as usual, the racing community turned out in full force to support the work of Anna House. The event was completely sold out, and approximately $300,000 was raised through live and silent auctions, raffles, and gifts. Jockeys: Alan Garcia, Jerry Bailey, Ramon Dominguez, Angel Cordero, Jr., Rajiv Maragh, Robby Albarado. Thanks to all who also worked as spotters during the live auction. Charles Hayward, Glenn Kozick, and Bruce Johnstone from NYRA were all in attendance, as were Jim Gallagher of New York Thoroughbred Horsemen’s Association and Terry Finley of West Point Thoroughbreds. This year’s honorees were Kiaran McLaughlin and Edgar Prado, who both spoke of the importance of the BCCA in the lives of the backstretch families. As anyone with a child knows, it’s difficult to do your job well when you’re worried about whether your children are taken care of, and the backstretch workers face even greater hurdles than most of us as they seek child care. They need to find a place that’s open when they go to work at 5 am; they need to find a place that will take care of their children on holidays; and they need to find a place that they can afford. Anna House offers all of this, and more. Auctioneer and trainer D. Wayne Lukas was joined by Donna Anderson as they worked to elicit as much money as possible from attendees, and their efforts were masterful. Gary Contessa bought a children’s Ferrari for $4,000. Mr. and Mrs. Wayne Evans purchased artist Robert Clark’s oil painting of the “Anna House Stakes Post Parade” (a painting he created as guests arrived) for $10,000, and then promptly donated it to Anna House. “It belongs there,” they said. Mr. and Mrs. Harold Lerner purchased two trips, one to Tuscany and one to the wine country of Sonoma, for a total of $19,000. Leona Velazquez, wife of jockey John, was the happy recipient of a Tiffany diamond necklace when her husband was the winning bidder. Liliana Prado will shortly be wearing a beautiful pair of diamond earrings, courtesy of Edgar. Owners Viane and Carl Lizza of Flying Zee Stable purchased a lawn jockey in “Anna House Stable” silks, signed by about 50 jockeys for $4,500; they are also taking home an Equicizer for $4,250. Anna House board member Libby Loftus Imperio and her Thoroughbred owning husband Michael were high bidders on the John Deere ride-on mower. Chad Brown, who won $6,000 when he tied Kiaran McLaughlin for leading trainer honors during Fasig-Tipton Festival of Racing weekend early in August, donated his prize money to the Belmont Child Care Association. Attendees were invited to purchase items for the school rooms, books for the library, and portions of Anna House tuition in increments of a week, a month, or a year. Yours truly went far beyond her budget when she saw this, donated by the Chenkins. 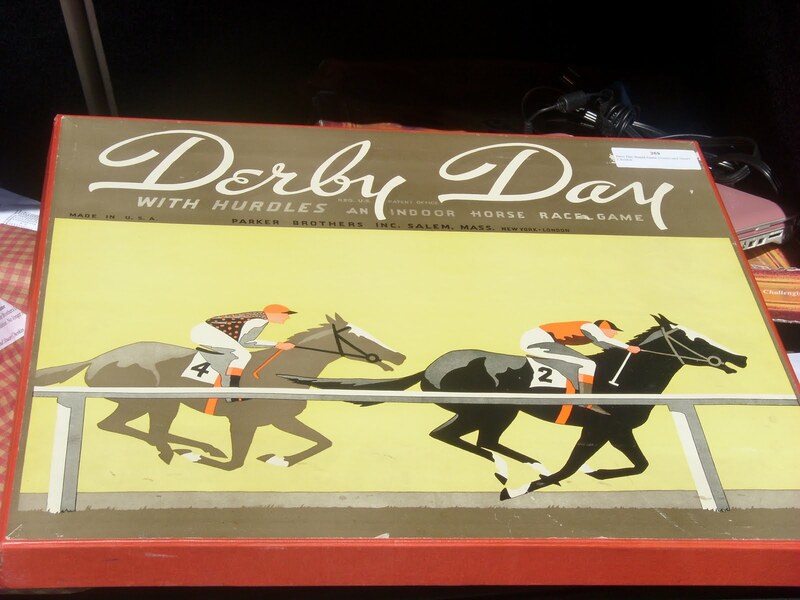 The Kentucky Derby board game, made in the 1940’s by Parker Brothers, is no longer manufactured, and it will join prized copies of old racing books in Brooklyn. Many thanks to reader, Backstretch friend, and professional photographer Ian Lozada, who donated a beautiful photo that he took of General Quarters winning the Bluegrass at Keeneland in April, and to everyone who helped make the event a success. Special thanks go to Fay Donk, president of the Belmont Child Care Association board of directors, and to Donna Chenkin, executive director, and her husband Stuart. In the weeks leading up to this event, they ate, breathed, slept auction items, decorations, and logistics, creating a party that was a huge financial success and a lot of fun to attend. The children of Anna House are the fortunate recipients of their effort, caring, and vision. Linda: I am all for that pool…but it still might not be enough! Donna & Stuart: all thanks go to you.Wayne & Tina: thanks so much for stopping by and commenting…thank you and have a wonderful trip!